When processing relatively wide widths, say 50 mm to 100 mm of high loft materials such as foam and nonwoven fabrics, the finished spools are wound into large diameter packages. Double R Controls Ltd. have a range of converting equipment which has the capability of winding spools up to 1.0 metre wide by 1.2 metre diameter depending on the specific requirements of the web being processed. Many of these materials are used in the hygiene and medical industries and in particular for the manufacture of diapers / nappies, wet wipes, bandages, feminine hygiene products, and adult incontinence products. 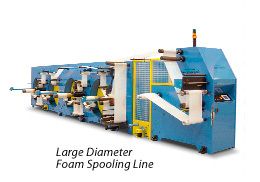 When processing foam products, the material itself is extremely extensible and special techniques have to be incorporated into the slitting and spooling section of the machine to accommodate these, this ensures that no distortion to the material takes place during the slitting and winding process. Some of the materials need to be slit using shear cut or crush cut knives and all these features are accommodated in the equipment manufactured by Double R Controls Ltd. Unloading facilities can be incorporated into the machine for ease of removal once the large jumbo spools have been created. We have developed a system which will allow pre-slit pancakes of material which have been created on the nonwoven making machine to be unwound and spooled as required. 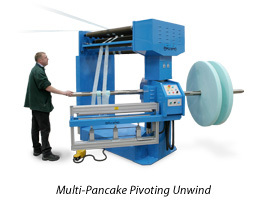 The pivoting unwind system means the operator is able to load the machine in readiness for a quick change round once one set of pancakes has been unwound. Heat joining of the material takes place which ensures the maximum integrity of the joint and this also provides a high speed change round from one set of pancakes to the other.